Buying, holding and selling coins all expose you to risks, as each one of these basic activities carries its own unique pitfalls. When you acquire a coin, you face the risk of it being worth substantially less than what you pay for it. While you are holding a coin, the coin can lose value as a result of market conditions. Finally, unwittingly selling a valuable coin for much less than it’s worth is a considerable risk. Risk 1: Acquisition risk. When you buy a valuable coin, you run the risk of overpaying for it. Paying $1,000 for a coin that has a fair market value of $100 is a risk. Multiply those numbers by any factor you choose, and you can see that the consequences can become large. Acquisition risk is probably the most important risk to overcome in buying coins because if you overpay significantly, you might never be able to sell your coin for a profit or even at a break-even price. Even when dealing with large, reputable dealers, vintage rare coins are sometimes marked up from 30% to 45% over what the dealer pays for the coin. Bullion and bullion-related coins, whose value relies mainly on the underlying precious metal, traditionally have a thin mark-up, often 2% to 12% over the dealer’s cost of the coin. And the dealer’s cost might be 3% to 10% above the “melt value” of the coin–how much money that coin would be worth if you melted it for its precious metal (e.g. gold or silver) content. When buying valuable vintage rare coins, choose coins that have been authenticated and graded by the Professional Coin Grading Service (PCGS) or the Numismatic Guaranty Corporation (NGC). These services grade or rate coins on a scale of 1 through 70 where 1 is worst and 70 is perfect. 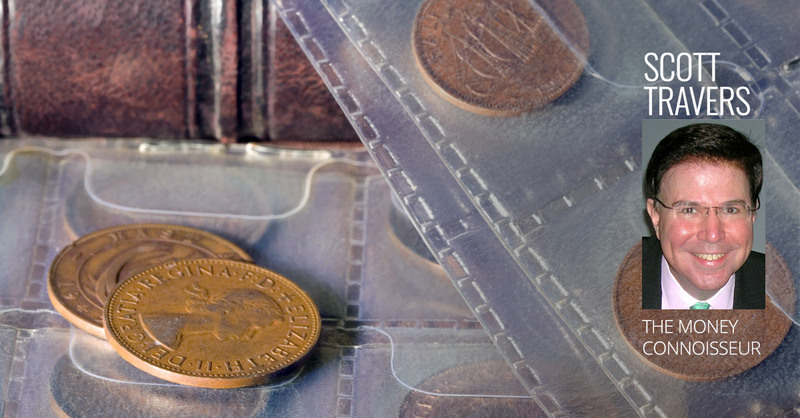 PCGS and NGC coins are encapsulated in sealed, tamper-evident holders with the grade prominently displayed in an insert visible above the coin. If you limit yourself to buying PCGS- or NGC-certified coins, and you have current value information from a reliable price guide, you will be placed on an almost-level playing field with a dealer who is selling the coin. Matching a coin you are considering buying with its corresponding price-guide value will go a long way to eliminating the acquisition risk. One valuable resource for coin values is the CDN Online Price Guide, where many coin prices are available with free online registration. You don’t have to be a dealer to register. My own book, The Insider’s Guide to U.S. Coin Values, 21st Edition, provides value and rarity data. PCGS and NGC also offer free online price guides. In buying PCGS- and NGC-certified coins, your risk is minimized even further by dealing with sellers who are authorized dealers of PCGS and/or NGC. Serious collectors of vintage U.S. coins have come to rely on the Certified Acceptance Corporation (CAC) for second opinions. The inherent subjectivity of coin grading combined with large value differences between grades has created feverish demand for CAC’s green holographic verification sticker. CAC applies its sticker to PCGS and NGC holders of certain rare U.S. coins that it believes are “solid for the grade.” CAC’s sticker is taken very seriously in the market, as its founder, John Albanese, was the founder of NGC and one of the original partners in PCGS. A CAC-verified coin can bring a substantial premium–sometimes far more than double its price-guide price—at auction. Meeting with an unknown seller offering an uncertified rare and purportedly valuable coin in the proverbial dark alley or flea market is unwise, as is buying through an online auction facilitator from a seller in a far-away land. Risk 2: Market risk. After you buy a coin and take possession, you face market risk. It’s possible that your coin’s value will spiral downward as a result of market conditions. Careful research of a coin’s price history can be invaluable in reducing market risk. PCGS offers price-change information that is invaluable in researching price trends. The trend can be your friend, but in the case of some vintage U.S. coins, it has turned out to be the worst enemy of collectors and investors. For example, some high-grade U.S. commemorative coins minted from 1892 to 1954 have gone down in value by as much as 80% in the past 30 years. These coin are obsolete, do not circulate, and have lost many of the collectors and investors who used to collect them. You could get hammered in the shorter term, too. For example, the 1926 Peace dollar graded MS-66 (on that scale of 1 through 70) has lost nearly half its value in just the past three years—$3,100 in June 2015 down to $1,600 in June 2018—a result of additional 1926 Peace dollars being certified with the same grade (more coins) and less demand (fewer collectors). Even for collectors and investors who do their current-value research and buy at wholesale, dramatic declines are possible. Of course, if you purchase commodity (not historic) bullion gold coins such as American Eagles, American Buffalos, South African Krugerrands or Canadian Maple Leafs, the price of gold itself is your market risk. Gold was worth around $2,000 per ounce at its peak in 2011—and lately has been worth only around $1,300 per ounce. Caution: Besides bullion-related coins and PCGS- and NGC-certified coins, there are also a large variety of coins produced for various countries by private companies such as the Franklin Mint that are often touted as “collectible.” Be warned that there is only a thin aftermarket for these coins. Many or most of these coins (and medals) are worth only the value of the precious metal they are made from. And unfortunately, we are seeing a similar trend for many modern coins produced and currently being sold by the U.S. Mint. The U.S. Mint has become the nation’s largest coin dealer, and it is manufacturing many different coins that have overwhelmed the collector market. I will be writing a blog post soon that explains how to know whether and when a U.S. Mint-promoted coin or collection is worth investing in. While you are holding your coins, they could also lose value from improper handling and storage, or they could be lost by theft, fire, flood or some other disaster. My writings on “protecting your coins in a disaster” are among my most popular although, admittedly, not for the faint of heart. This topic, as well, will be covered here in a future blog post. Risk 3: Sale risk. You can overcome the first two risks and still lose money: You could buy a coin for $1,000 whose fair market value was $1,000 at the time you purchased it; hold that coin while its value climbs to $10,000; and end up selling it for less than what you paid, if you don’t know what it’s worth and sell it to an unscrupulous or unknowledgeable buyer. Or your heirs could end up selling it for far less than it’s worth because they don’t know any better. Coin buyers who knowingly make lowball offers to consumers who have coins to sell are common in the land of hotel coin buyers and at flea markets. Just as you did when you bought a coin, when you sell it, deal with a mainstream, established dealer who is involved in the coin community and a member of the leading trade organizations. You now know about the grading services PCGS and NGC, as well as price guides, as resources when you buy coins. Use those same resources when you sell coins. Match your PCGS- and NGC-certified coin with a reliable price guide, and you will have a good ballpark value as long as your coins are generic or exist in quantity. Truly unusual, high-quality, rare and valuable vintage U.S. coins are like snowflakes and, especially if CAC-verified, can sell for a multiple of what every price guide indicates. Sometimes, a coin brings a runaway price at auction because it was given a grading-service grade that is lower than it should have been—and knowledgeable would-be buyers know it. When these services began rating coins in the 1980s, at times they were hesitant to hand out high grades. These coins when regraded today are often assigned higher grades. 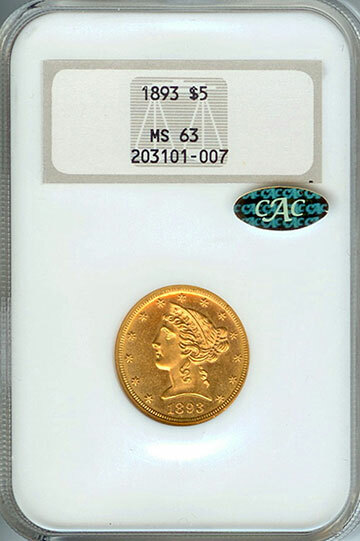 Example: The 1893 Liberty Head half-eagle ($5 gold piece) with CAC verification (shown below) was graded by NGC many years ago. The price-guide value for this coin in Mint State 63 as graded is $600. But when this coin was recently offered for sale, dealers and collectors offered thousands of dollars for it because they recognized that it deserves a much higher grade on that 1 through 70 scale. So if you have coins in old grading-service holders, ask your PCGS- or NGC-authorized dealer about having those coins regraded before you sell them. If you are selling your coins outright (not auctioning them), you should consult more than one dealer for offers. That’s the best process for selling collectible but not very unusual or special coins. Rare and very valuable vintage U.S. coins should be sold through public auction or competitive private sale. The public auction or competitive private sale should be held in conjunction with a major coin convention so that there will be plenty of potential buyers who can physically look at your coins. Coins that derive their value from the metal they are made from should be sold directly to a precious metals dealer during trading hours. Coin collectors and investors spanning generations have individually made hundreds of thousands, and in some cases many millions, of dollars in profit from the sale of their collections. And it was all because they were able to count to three—and overcome the three risks that count.